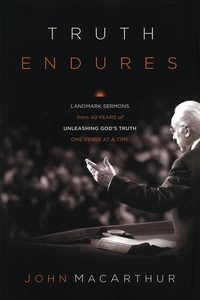 Truth Endures commemorates that lifelong focus by bringing together twelve of MacArthur’s classic sermons, including “The Simple Gospel,” “The Purpose of Trials,” “Jesus’ Death Shows Us How to Live,” and “Making Hard Decisions.” MacArthur’s veteran years of ministry experience shine through in each Bible-centered sermon. John MacArthur clearly has a love affair with sacred Scripture. He understands that what the Bible says, God says. He submits his mind and his will to the truth of the Bible. Not concerned with echoing clichés on biblical texts, John digs deeply—deep into the original languages—deep into the text itself—and then expounds with clarity and courage what he finds in the text. He has no interest in novelty or self-aggrandizement. His passion is fidelity…fidelity to Christ…fidelity to the Word of God.